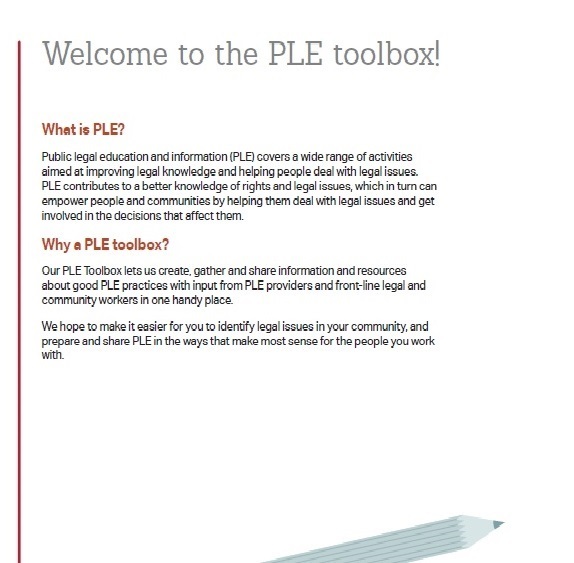 CLEO’s Centre for Research and Innovation is pleased to share a rough draft of the first “drawer” or module in our Public Legal Education and Information Toolbox (PLE Toolbox). We’d really welcome your feedback on this draft – you’ll find it in PDF format at this link. 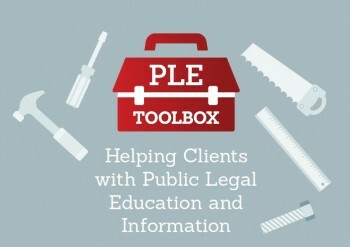 We’re aiming to create, gather and share information and resources about good public legal education and information (PLE) practices with input from PLE providers and front-line legal and community workers in one handy place. 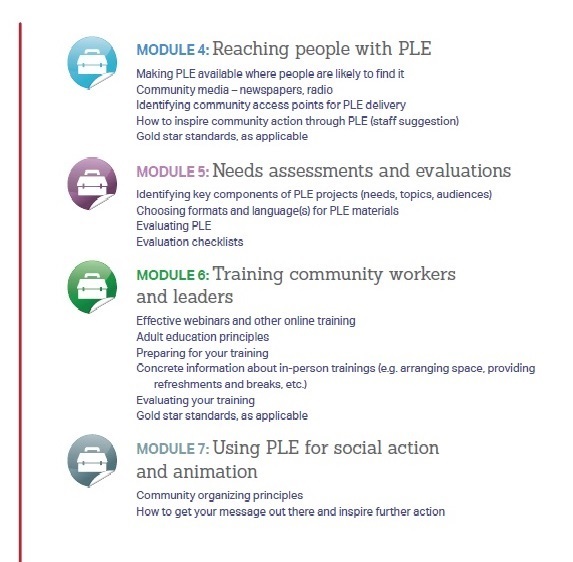 The PLE Toolbox will eventually reside here on the PLE Learning Exchange website in HTML format (with a companion in PDF format to allow people to print out and distribute the information). It’s geared toward community workers and other intermediaries here in Ontario. Our first module – one of 7 we’ve planned – includes information on how to detect legal issues, find credible and accurate legal information and help your clients prepare to deal with a legal issue. We’ve compiled some information about the differences between legal information and legal advice. Does the list we’ve come up with accurately reflect your understanding of what cmomunity workers can and cannot do to help their clients deal with legal issues? We provide one sample checklist intended for community workers to give to clients for follow-up on their own. Would similar checklists be helpful for all of the other categories covered here? Why or why not? 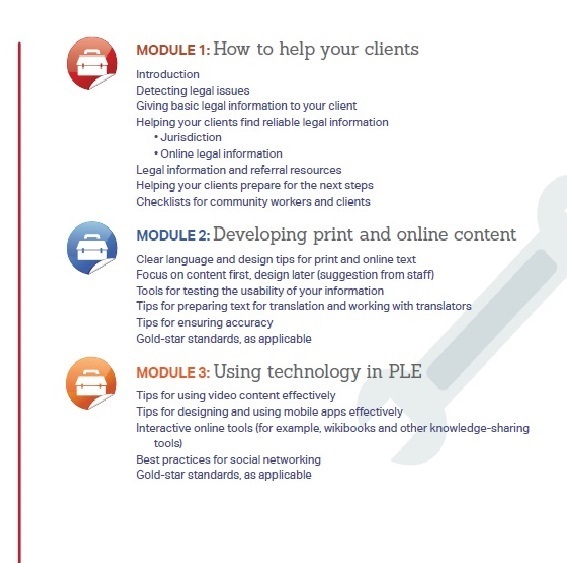 The last section of this module provides some tips on how to help your clients develop legal capability or prepare for meeting with a legal service provider. Do you have any tips of your own that you’d like us to share? Is there anything else you think we’ve missed or should build upon? Kindly note that we’re grateful to the Centre for Public Legal Education – Alberta for their permission to adapt their excellent resource, “Is it reliable? – 7 Clues to Good Legal Information Online” for use in our PLE Toolkit. Thank you in advance for your suggestions about the PLE Toolkit – please feel free to leave them in the “comments” section below, or email Kristina Brousalis. The toolbox looks wonderful. I would suggest that you add a caution AGAINST looking directly to the applicable statute or regulation when seeking reliable and understandable legal information for a client. I see many workers looking at legislation for the answers they seek and that is problematic for many reasons. Statutory interpretation is tricky at best even for lawyers; it is generally beyond the skill set of the average community worker. Also, most statutes have implementing Regulations that workers either miss entirely or don’t understand; the interplay of the Reg with the Statute can be the stuff nightmares are made of. Finally, statutes and regs are all subject to judicial review and interpretation that can impact how they are enforced, how policies are drawn and implemented, etc. This is another aspect of the law that is generally not withing the expertise most community workers. With the wealth of PLE materials available, especially through CLEO and YLR, it should not be necessary to look directly to a statute. If it is, I suggest that the matter may be beyond what a worker can handle and it is time to refer the client to legal counsel. JMO. The table of contents you’ve developed looks really exciting and innovative. I haven’t seen a resource quite like this and I think that having a guide for non-profit organizations and community workers that will assist in developing better PLEI resources is immensely valuable. The material in module 1 was well laid out and articulated, though you could easily flesh it out to provide greater detail and context I think. That said, I felt that the content in the first module covered issues that are perhaps covered more extensively in other resources and which seemed more familiar than some of the topics you plan to cover in subsequent modules. Further, the content in module 1 addresses direct client interaction issues while the rest of the toolkit seems geared toward developing PLEI resources. As such, I think there’s an argument to be made in favour of further fleshing out module 1 and releasing it as a separate resource rather than integrating it in a resource like this which is primarily geared toward developing PLEI resources. On a separate note, as a visually impaired user, I very much appreciate that you will be releasing the toolkit in both HTML and PDF format as it will make the toolkit easier to manipulate for accessibility purposes.